Facebook continues to experiment with ways to let users customize their News Feeds, and See First, which appears to be an expansion of a test that was spotted in April, is the latest example. In late April, some Facebook users began seeing a box with an animated puppy and the prompt, “See more of what you love,” which led to a screen with bubbles containing the profile pictures of friends and pages they had interacted with the most. 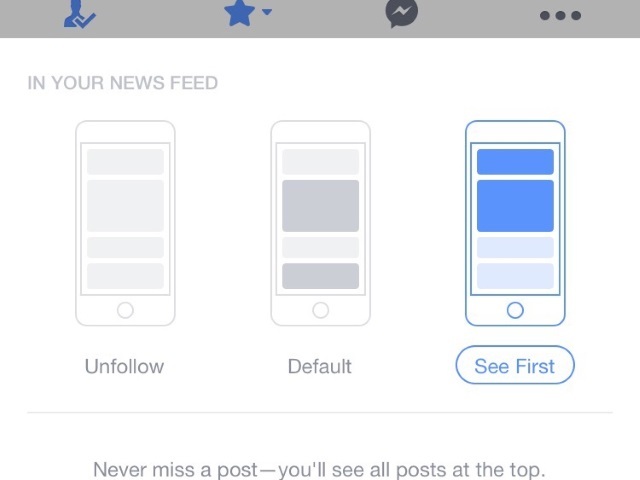 At that point, users were able to select which pages and friends to prioritize over Facebook’s News Feed algorithm. Thursday, Josh Constine of TechCrunch shared the screenshots above and below of a feature called See First, which is appearing on select profiles and pages. As the title suggests, See First allows users to specify that they want to always see content from the selected profiles or pages. Options also appear to unfollow or return to the default (the News Feed algorithm, presumably). We are always exploring new ways to improve the Facebook experience, and we are currently running a small test of a feature that lets you indicate that you’d like to see posts from a specific person or page at the top of your News Feed. That quote matches nearly word-for-word a statement Facebook provided to SocialTimes in April. Readers: Would you like to see Facebook roll out this feature, or something similar?